The textile mills market includes yarns and fabrics. The market value includes domestic production plus imports minus exports, all valued at manufacturer prices. 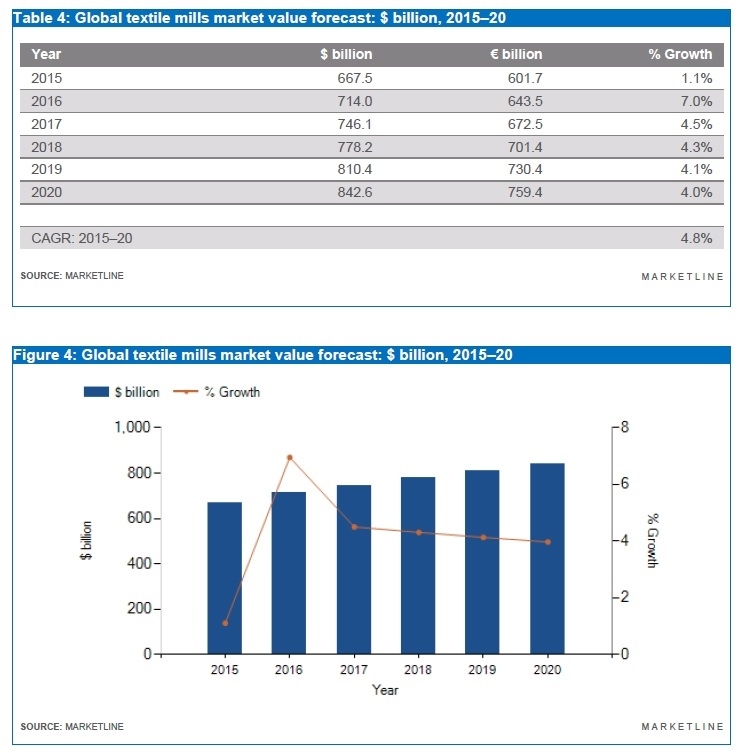 The value of the global textile mills market totaled $667.5 billion in 2015 (around 83.1% were fabrics and 16.9% were yarns), up 1.5% from a year earlier. The compound annual growth rate of the market was 4.4% between 2011–15. Asia-Pacific accounted for 54.6% of the global textile mills market value in 2015 and Europe accounted for a further 20.6% of the market. The global textile mills market is forecast to reach $842.6 billion in value in 2020, an increase of 26.2% since 2015. The compound annual growth rate of the market in the period 2015–20 is predicted to be 4.8%. The apparel market covers all clothing except leather, footwear, and knitted items as well as other technical, household, and made-up products. The market value includes domestic production plus imports minus exports, all valued at manufacturer prices. The value of the global apparel market totaled $842.7 billion in 2016 (estimated), up 5.5% from a year earlier. The compound annual growth rate of the market was 5.2% between 2012–16. Asia-Pacific accounted for 60.7% of the global apparel market value in 2016 and Europe accounted for a further 15.0% of the market. 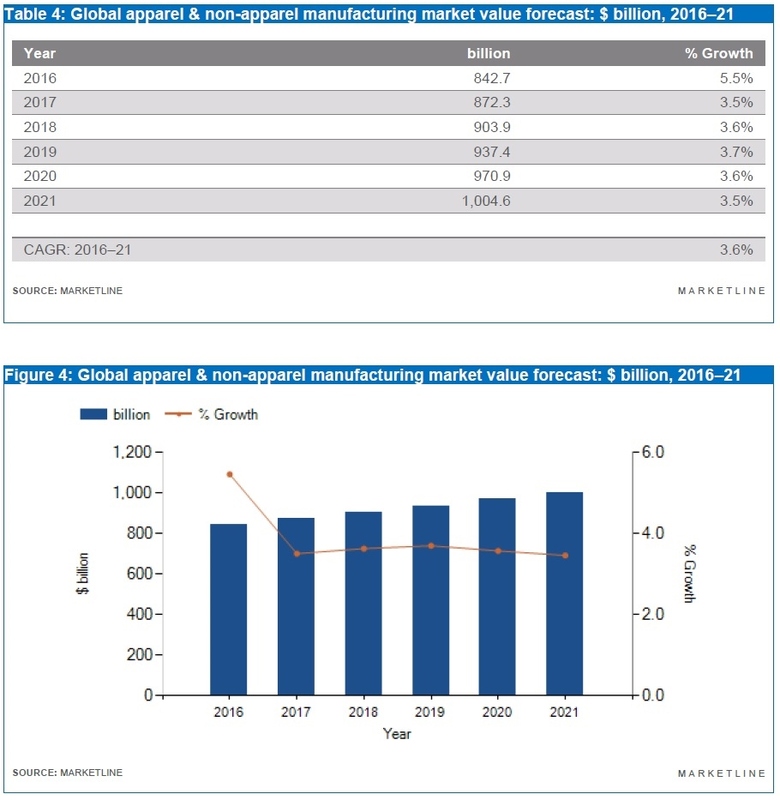 The global apparel market is forecast to reach $1,004.6 billion in value in 2021, an increase of 19.2% since 2016. The compound annual growth rate of the market in the period 2015–20 is predicted to be 3.6%. The apparel retail industry consists of the sale of all menswear, womenswear and childrenswear. The industry value is calculated at retail selling price (RSP), and includes all taxes and duties. The value of the global apparel retail market totaled $1,254.1 billion in 2015 (52.9% womenswear, 31.2% menswear and 15.9% childrenswear), up 4.8% from a year earlier. The compound annual growth rate of the market was 4.5% between 2011–15. Asia-Pacific accounted for 36.8% of the global apparel retail market in 2015, followed by Europe (27.8%) and the United States (24.0%). 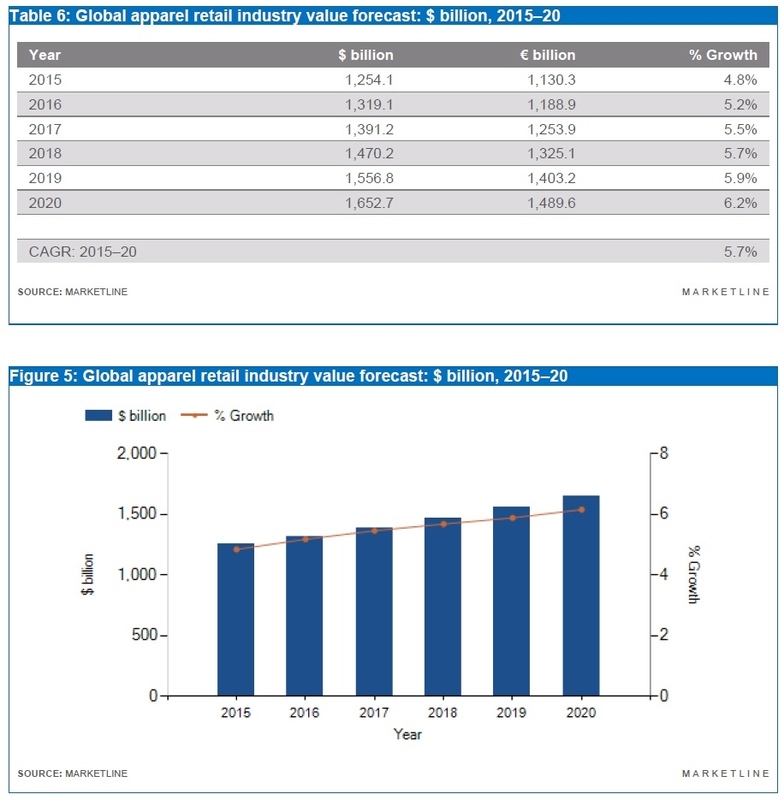 The global apparel retail market is forecast to reach $1,652 billion in value in 2020, an increase of 31.8% since 2015. The compound annual growth rate of the market in the period 2015–20 is predicted to be 5.7%.